The New York Police Department (NYPD) has acquired 14 new drones from Chinese UAV maker DJI to revamp its force. Only licensed NYPD officers of the Technical Assistance Response Unit (TARU) will be cleared to operate them. According to an NYPD press release, the new technology will help keep New Yorkers and officers safe by dealing with inaccessible crime scenes or violent hostage situations. TARU provides specialized investigative equipment and tactical support to all bureaus within the NYPD, from officers on patrol to the Emergency Service Unit (ESU). The unit’s expertise in audio/visual technology helps enhance investigations through the recovery of surveillance video footage. It also records police action at large-scale demonstrations and arrest situations, apart from providing crucial live video to incident commanders during ongoing emergency situations. “As the largest municipal police department in the United States, the NYPD must always be willing to leverage the benefits of new and always-improving technology,” said Police Commissioner James P. O’Neill. 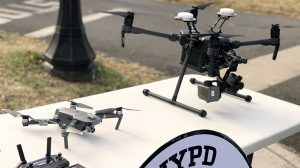 The Unmanned Aircraft System (UAS) program will help NYPD gather crucial information as situations unfold without putting officers at risk, and lessen harm and danger to civilian bystanders and other involved parties. A total of 11 DJI Mavic Pro quadcopters will be used for tactical operations that require quick deployable small drones. Two DJI M210 RTK quadcopters will be utilized for search & rescue missions and 3D mapping as these large drones come with 30x zoom camera and thermal imaging capabilities. A sole DJI Inspire 1 quadcopter will be employed for training and testing purposes, states NYPD’s press release.